Its always very humbling to visit a garden once it has become established. We do a lot of soil preparation before we put the plants in, to give them the best possible start to their new life. We visited this garden recently and I was very surprised to realise that we had only finished it 9 months earlier. Major kudos to the home owner who loves spending time in his new garden and takes great pride in how it looks. What do I need for my initial consultation? So you have decided to get professional help with your garden. What do you need for that first meeting? Plans - A site plan and a house plan. If you dont have one, you can usually get a copy from your local council. Some charge a small fee for this process. Likes - Pictures of gardens that you have seen and liked. Good places to find suitable pictures are books and magazines, but there is also some great online sources as well. Try Pinterest, Houzz and Homify. You can often save your favourite pictures to a file and then share them with your designer via email. Dislikes - Just as important as pictures of gardens you like, is a good idea of what you dont like. Budget - This is always a hard questions as most people dont know what it costs to build a garden or what they should spend on doing it. A good rule of thumb, for a new house is 15-20% of the capital value of the home. The cost of the garden will ultimately come down to the cost of finishes, the amount of space you have, the scale of the works that your are after and your access. By providing your designer with a rough budget, they should be able to design the garden to create a suitable outcome for the space. Alternatively, the designer can design the space with your wish list, then provide a costing that you can work through together, to remove and add items until you are happy with it. A designer can also tell you the best way to phase the works, so if budget doesnt allow, then get the best use of your money now and then add the extras down the track. Function - A good thing to think about before meeting your designer is 'How do I want to use my garden?' Do you want to entertaining large groups of people regularly, large lawn areas for children to play, a lap pool for the swimmer in the family or just a small plunge pool for chillaxing in summer? Do you need a shed, a clothesline, somewhere for the bins, veggie garden, trees.....the list goes on? The best thing to do is to start writing a list and bring it to the consultation. 1. Create a daybed/or reading nook in your garden. Whenever you want a quiet moment or the weather is beautiful, you will find yourself gravitating to this spot with a book and a cup of tea whenever you can. 2. Update with new brightly coloured cushions and matching accessories to your alfresco. 3. Put in a herb garden. Planting herbs you use regularly such as mint, parsley, rosemary, basil and sage is a fantastic extension to your kitchen, and you are more likely to step outside to snip some fresh herbs for your cooking if its just a few steps away. 4. Liven up a dull space with a vertical garden. Can be made simply using some leftover pallets. 5. Add a tree. - For shade, fruit or simply to provide some vertical scale to the garden. 6. Paint your fence. - So often I go into gardens where the fence has been left unpainted or its a light colour. The best fence colours is a dark colour, so then the fence blends into the shadows of the planting. Opposite to interiors, a dark fence will make the garden appear bigger. Being a Landscape designer, I am often specc'ing products into my clients gardens that I can rarely afford myself. One of my big loves is rusted steel planter boxes. I custom design these to fit into particular spaces, and they take up a lot less room than building in a brick version. The offer a great contrast to other surfaces around them and the thin nature of them means more soil and space for the plants. A steel planter that I designed into a TDL garden. This one hides an ugly junction between retaining walls. 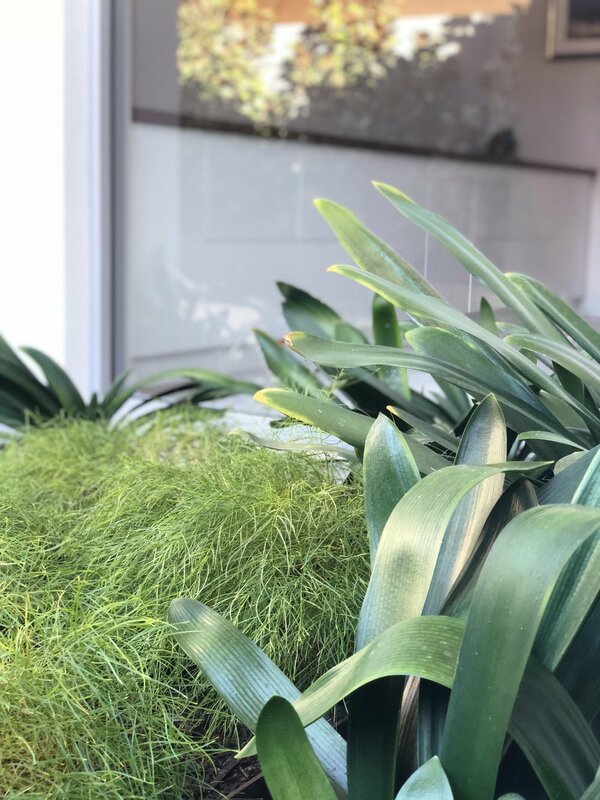 When I purchased my little town house with its tiny courtyard, I knew I wanted to plant bamboo, to provide a little privacy, but also to block out the ugly walls of the two storey townhouses. I wanted the bamboo to be in planters so there was no fear of them getting out of hand, or growing into neighbouring gardens. So of course steel planters were the perfect solutions. But there was no way I could afford the outlay to purchase the number required to put around the perimeter of the garden. Pinterest to the rescue! I was scrolling through one day and spotted an old filing cabinet that had been spray painted a bright colour and it was filled with home grown veggies.....yum. Found on Pinterest. Author unknown. First, I removed and discarded the rails etc, then drilled a heap of holes in the bottom for drainage. Painted the insides with 2 coats of Crommelins Blackseal to slow down any rusting from the inside out, following the manufacturers instructions. Once that is dry, then comes the fun part. Using your chosen colour of spray paint, coat the outside of the cabinets several times. Make sure you get a good even coverage to all exposed areas, again to help protect it from surface rust. I then added my drip irrigation. This was fed through one of the holes in the base. Locate your planters where you want them. Once the soil is in, they will be impossible to move! A little paint on the fence helped improve the look of things too! Colorbond Monument is a colour I like to use on fences. Once the plants are in place, the fence then becomes the shadow and the plants stand out. Use a good quality potting mix and add your plants. These are Slender Weavers Bamboo (Bambusa textiles gracilis) which are fast growing, grow well in narrow spaces and get to a height of around 3m. Some Lirope is added around the base to soften the edges. One day, this paving will be removed and I will have decking....just one of those things I spec, but can't afford! This is how the garden looked after one year...and how we use the courtyard in summer. Umbrella up and an ice cold Corona. Today (2 years later) some of the canes easily reach 3-4 metres. The Liriope gigantia is going gangbusters and the pots are standing up strong. They could all use a little touch up paint, but rusting is not a problem yet. While trawling through through hundreds of Pinterest pictures a few weeks ago (something I like to do while I am having a horizontal moment on the couch) I found the most amazing pictures of hanging gardens or as they are more formally known 'Kokedama'. This of course immediately tweaked my creative interest and I HAD to try making one....or four! There are a few websites that run through the process of making them and even YouTube videos. But here is how I made mine. Firstly, mix 1/3 of each the bonsai mix, peat moss and clay into a container with a little water. Keep mixing until it comes together to form a ball. This ball should hold its shape if you toss it in the air. Then you need to gently knock the soil off the roots of your plant. The more you can remove, the better. Then wrap the roots with a small amount of wet sphagnum moss. Split the soil ball in half and put your root ball inside. Then work the soil firmly around the roots to seal the ball completely. Then you can start placing large sheets of the green moss around the ball. I quite enjoyed how this felt. I think that the texture reminded me of playing with moss in the bush when I was a child. Press each sheet on firmly and tear off smaller bits to fill any gaps. Then start wrapping the ball firmly with the string, winding in many directions to secure all of the green moss. When you are happy with the finished look, and that the moss is secure, tie it off. This one was hanging by the string, but I've started cutting the string off and looping some fishing line through to hang it. For something different, try wrapping your ball in a brightly coloured string. Sphagnum moss can be used to cover your ball if you are having trouble with the green moss. Maintenance ... I've found the best way to water the plants is to dip the ball in a bucket of water for a few seconds. Also spray the leaves with a water bottle occasionally. Ive hung 3 of these in a protected spot near my front door. My visitors see them when they arrive and they are right outside my office window..... Little bit of green in my concrete jungle. Well its been a few months since my last post. Ive been flat out, and with Easter, school holidays thrown into the mix, and a heap of new clients. I have simply been too busy to write! BUT, I have also been busy creating and building, which I also love to do. I live in a townhouse, with very limited garden space and I struggle with the 'want', to have a beautifully designed garden and the 'need' of practical plants that provide herbs, fruit and veggies for my cooking. My entire yard. Mess and all! But after seeing a few inspiring pics on Pinterest, I wondered if I could make a vertical pallet garden work, with some of my favourite herbs and small veg. I have a skinny side area, where I have my clothesline, bins and air-conditioning condensers. So I thought why not give it a go. A good strong pallet - available on building sites...but check before you take them, that they are rubbish. Some companies ask for a bond and the builders don't get it back unless they return them. Weed mat or other horticultural material, that will hold the soil. Plants - planted seedlings of Rocket, lettuce, thyme, climbing spinach, cat nip and cat mint (for Monkee) Strawberries, tarragon. Once it was standing I added Cherry tomatoes and Artichoke to the top! Firstly, check your pallet for exposed nails and staples and affix any loose boards. I also added some staples to the sides, to keep the soil from escaping. Then I added my irrigation. Here I have black poly pipe affixed to the outside, which connects to my irrigation system. Then I have fed 6mm Netafim drip tube at intervals, positioned at the bottom of each rung on the front so they drip over the plants. Install the irrigation. I used a black poly feed along the side and connect strips of 6mm Netafim. Fill the pallet with the planting mix, then staple the weed mat to the back. Make sure you use plenty of staples to stop the soil escaping. Add potting mix, and then the back cover of weed mat. Make sure to staple well to keep the soil in. Stand the pallet up and let the soil settle, then fill with more potting mix to the top. Stand it up and let the potting mix settle, then add more to the top. I added some waterproof material to the back, as its going against my house wall and I don't want it to stain. This was actually some plastic root barrier that I had in the garage. Always take every opportunity to recycle :) You could also use some plastic or blue board to seal the back. My waterproof backing is some root barrier that I had in the garage. Blueboard would work just as well, but you will need to nail it on. Lay it down again to add your plants. Make a little slit in the weed mat, wherever you want a plant to go. I made a little hole with my hands, and then pushed my seedlings in (very carefully). Lay it down again and cut holes for your plants. Carefully make room in the soil with your hands and put the plants in. Leave for 2-3 weeks for the roots to establish in the soil. Leave it on the ground and keep it well watered for a couple of weeks so that the the roots establish. Once you are happy that its all growing well, stand it up and move it into position. Don't forget to hook it up to your irrigation system. It's also a good idea to fix it to the wall with some dynabolts (or whatever is required for the surface you are putting it against) to stop it from falling and crushing someone. This is my pallet garden today...3 months later, under my clothesline. The plants on top grow well as they get more of the sun. The cat mint and catnip are also going great guns at the bottom. I think I just need to find some herbs that like a bit more shade. The Rocket is massive! Need to eat more of it :) and the climbing spinach is sensational! You can use all sorts of plants in your vertical garden. I had another space which was in full shade and a bit boring, so I did a taller pallet with shade plants in it. I was going to paint the pallet to be the same colour as the fence...but in the end I liked having the pallet stand out as a pallet. Any sort of plant can be used in your vertical garden. This one hides a fence in a shady spot, so is filled with shade loving plants. Unfortunately Monkee now uses it to climb the fence and visit the neighbours! Establishing a new garden takes time, and to ensure that is effective in the years to come it will require regular ongoing maintenance to protect the defendable space around your home. Clear ground fuel from underneath plants and around the house. Re-mulch with non flammable materials, such as stone, shells or other non-flammable materials. Prune plants with low hanging branches, providing separation of at least 2m from the ground. Replace diseased, stressed or dead plants. Ensure to replace with low flammable plants as per my previous post. Keep plants well hydrated through watering and mulch. Watering less frequently but for longer encourages the plants to develop deeper roots and therefore reducing moisture loss during hot spells. Remove other flammable objects from within your defendable space. Remove any fine, dead material that has accumulated within plants. Remove weeds from the defendable space. Mow lawns and keep regularly hydrated. Please stay safe for the rest of this bushfire season. That is the end of this series of posts. Im really looking forward to sharing with you over the next few weeks some other things I have been working on lately. How to make a pallet garden for your herbs, filing cabinet planters, design lessons learned along the way, and my week in Bali. Perfect plants to reduce the intensity of a bushfire near your home. The next task, after planning and designing your home and garden, is to choose suitable plants. Selecting plants with some intrinsic characteristics, that reduce the likelihood of ignition, could help reduce the bushfire risk within your garden. There are several characteristics that influence how flammable a plant is. These are plant flammability, plant moisture content, branching patterns, texture, density, leaf size and shape, bark type, oils, waxes and resins, and the retention of dead materials. Some plants are more flammable then others and the flammability can vary in unpredictable conditions. Plants, such as succulents, with a high moisture content will not burn until the moisture has been removed. Plants can dry out as a result of radiant heat, especially if they are exposed for long enough. Dry plants will ignite more rapidly and continue to burn until the source is removed. Time of day - before sunrise, plants are typically at their most hydrated. As they transpire during the day the moisture content decreases until the plants stops after sunset. Most plants are most flammable in mid to late afternoon. Part of the Plant - Leaves and new growth generally have a higher moisture content than stems and branches. Dead leaves and twigs have little moisture and become highly flammable on hot, dry days. Where it is planted - The sun and shade, availability of water, drainage and soil type will affect plant moisture. Environmental conditions - High temperatures, low humidity and periods of drought will increase the flammability of plants. The age of the Plant and its growth stage - Plants start as moisture rich shoots and become woody as they age. The older the plant, usually the drier. New growth is generally soft and fleshy. This influences the distribution and density and foliage with the plant. Plants with branches at least 2m above ground are better than those with foliage to the ground and stops the foliage acting as a ladder for fuels. Coarse textured plants are less flammable than those with a fine texture, because they have a lower surface area to volume ratio. A plant that is hard to place a hand into, or see through is very dense. These are often more flammable due to the higher fuel load. The fineness, size and shape of leaves affect their flammability. Wide, flat and thicker leaves usually means a higher moisture content, so therefore less flammable. Small, thin narrow leaves have a high surface area to volume ratio, which tends to make them more susceptible to drying out. Leaves with high levels of oils increases flammability. The shape can influence how easily they are caught in vegetation when they fall off the plant. If leaves are caught in the plant this can increase flammability. Some bark types ignite more readily than others. Bark that is loose, stringy or fibrous will ignite easily and can also act as ladder fuels. Bark that attaches tightly or is smooth in texture is less likely to ignite. Some smooth barked trees shed their bark annually and trap large ribbons of bark in their canopy. These ribbons are highly flammable and can be carried as embers and can act as a ladder fuel. Natural chemicals found in plants can increase their flammability. These plants often have a strong scent when crushed. These plants should be limited and placed carefully within the garden. Dead leaves, twigs and branches that remain on the plant, or accumulate on the ground increase the flammability of an otherwise fire wise plant. Regular pruning and maintenance of all trees and shrubs to remove these fuels is necessary. Dead leaves accumulating at the base of the plant increases fuel. List of Plants and Trees suitable for a garden in a fire prone area. The hills of Western Australia generally provide excellent conditions to grow gardens. The conditions allow for a wide range of plants to be grown successfully. As a result, hills gardens often display great diversity and layers of vegetation. Many gardens are located adjacent to national parks and native forests that are highly flammable. The local site and context should be taken into careful consideration with each design. This property is nestled into the side of a hill with national park beyond. This property required substantial retaining walls, which in turn would help to create barrier to a fire coming through. Strong seasonal winds, coupled with salt can make establishing and maintain a coastal garden particularly challenging. Along with sandy soils with poor water and nutrient retention, the addition of organic matter and mulches is critical to garden success. Creating microclimates is the key to a successful coastal garden, by providing shelter and screening to maximise these problems. This house, very close to the beach is subject to constant high winds. Any fire coming off the dunes needs to be quickly stopped before it consumes the house. Recently, severe fires have moved beyond the rural fringe and into our suburbs, especially as many of our new suburbs are creeping into the outskirts of the city. The planning principles from last weeks blog, should be followed as closely as possible, given the limited suburban space you may have. Luckily for this house, they have quite a substantial sized block, compared to a lot of the new suburbs being currently built. However, the same principles apply. Many rural gardens are on large farming properties and the house and garden location should be considered carefully, along with the placement of other structures, elements and services. Paddocks surrounding a house can quickly dry out over summer causing fire to spread rapidly. The defendable space around the house is the most critical component, along with good planting and design strategies. Also note that the house position is relatively close to the roadway and the driveways give fire trucks and other services plenty of room to access the property. This property also has a 5m wide fire break around its entire perimeter. The neighbours each have the same, therefore creating a good sized 10m fire break around their properties. In next weeks blog we will look at what plants you can put in your garden that will reduce the chance of ignition, or lower the intensity of the blaze. Effective defendable space, house construction, water and access in new and existing gardens can all be compromised by inappropriate landscaping. The following design principles outline how defendable space can be used to reduce radiant heat, prevent flame contact and minimise ember attack on the home. Requirements for defendable space will vary, depending on the type of development and level of bushfire risk to the property. A bushfire site assessment (contact me if further details are required on acquiring one of these and I will put you in contact with the appropriate people) may be required as part of your planning permit process. This permit will impose the conditions and the size of your defendable space zones. There are generally 2 zones, each having different considerations. The Inner Zone, is the area immediately surrounding the house. Vegetation needs significant management, so that fuel is managed to a minimum level in this zone. Flammable objects such as plants, mulches and fences must not be located within 10 metres of vulnerable parts of a building such as windows, decks and eaves. Trees must not overhang the roofline or touch walls of a building. A canopy separation of 2 metres is recommended with total cover being no more than 15% at maturity. Grass should be no longer than 5cm in height, and all leaf litter and debris should be removed regularly. Shrubs should not be planted under trees. Planters taller than 10cm in height should not be placed under windows or other glass features. The Outer Zone sits between the inner zone and unmanaged vegetation. Vegetation in this zone is managed to a more moderate level to decrease the ground fuel and restrict other fuels available to an approaching bushfire. Grass should be no longer than 10cm, and leaf and other debris should be mowed, slashed or mulched. Trees and shrubs should not form a continuous canopy. Overall canopy cover should be no more than 30% at maturity, with few shrubs in the under storey. Any branches within 2 metres above ground level should be removed. Shrubs should be in clumps of no greater than 10 metres square, which are then separated by a further 10 metres. Non flammable features such as tennis courts, swimming pools, stone walls, dams, driveways or paths should be incorporated into the proposal, especially on the sides of the house where the prevailing winds are most likely to occur. Use materials such as brick, concrete, earth, stone, non combustible water tanks and galvanised iron to create radiant heat barriers. Locate driveways and paths to create separation between the house and vegetation. Use gravel and pebbles such as scoria, shells, recycled crushed brick etc to mulch garden beds. The immediate area surrounding the house should be clear of flammable objects. There are a number of things that can be done to support this principle. Locate driveways, paved areas and paths against the house to create separation. Ensure trees are planted away from the house so they don't cause damage, especially if they fall. Ideally the should be located at least one and half times their mature height away from the house. Avoid flammable mulches. Great alternatives are gravel and pebbles such as scoria, shells, recycled crushed brick etc. Use non-combustible, moveable containers and pots that can be relocated in summer. Remove other flammable objects such as sheds, caravans, outdoor furniture, bbqs, gas bottles, and wood piles. When a plant catches fire it can preheat and ignite the vegetation around it, so one of the most effective ways to reduce the spread of fire within the garden is to create separation between plants, garden beds and tree canopies. Grouping plants and garden beds with areas of low fuel between them can help avoid spread, by breaking up the fuel continuity. Locate shrubs and other flammable objects away from trees. Clumping trees and shrubs so they don't form a continuous canopy. Separate with areas of low fuel. Use hard-scaped paths, non-flammable mulch and mown lawn to provide separation. Prune branches to a minimum of 2m above ground. This provides vertical separation between ground level fuel and the canopy. Tennis courts, pools, water features, driveways, stone walls etc also provide fuel seperation. Locate trees at a safe distance from buildings. At least 1.5 times their mature height. Regularly remove dead leaves, bark and branches as well as leaf litter from underneath the trees. It takes time for trees to grow and they may not provide protection for many years. Wind direction can change and spot fires occur, allowing the fire to approach from any direction. There needs to be adequate separation between a building and the windbreak. A windbreak should not be planted within the defendable space. Trees should be carefully selected and then maintained frequently. Highly flammable trees will become a fire hazard. The windbreak should be planted at right angles to the prevailing winds. It should allow some wind to pass through. It should continue for at least 100m if possible. Well watered grass should be planted underneath windbreak and maintained regularly. The windbreak should be maintained regularly to remove any dead plant material or leaf litter. In the next instalment we will look at some garden designs, and how apply these principles. Reducing bushfire risk is most effective when considered early in the planning process, and there are a number of factors to consider. The first thing you should be aware of, is your local building and planning requirements. These vary from council to council and could influence where the house can be built, the level of construction required, and even how they want the vegetation managed on your property. One of the most effective ways to reduce bushfire risk is to locate the house in the most appropriate location. Ideally the house should be located away from unmanaged vegetation, steep slopes, saddles or narrow ridge tops. Ideally as close to public roads and accessways, as you can. You should also look at the risks from surrounding properties and if the existing vegetation within or close to your property could pose a significant risk. The design of the house plays a part too. Anywhere embers can lodge or enter a house can pose a risk. Things like decks, windows, doors and roof areas or complex designs that create little nooks and allow leaf and plant debris to accumulate can all contribute to the overall risk. This is an area of land around the buildings where the vegetation is modified and managed to reduce the effects of flame contact and radiant heat. This is comprised of an inner and an outer zone with different vegetation management requirements, careful garden design considerations and requires regular maintenance as part of your Bushfire Survival Plan. Essentially this is a clearance zone around your home, and the size will depend on the planning scheme of each council. This does not mean clearing all plants and trees. Some plants are lower in flammability and are suitable to be closer to the house. Locating things like lawn, ponds, pools, tennis courts, concrete, gravel and paving, close to the house is helping to create a defendable space. We will look into this further in the next blog. Construction standards are linked to defendable space and the greater the defendable space, the lower the construction requirement under the Australians Standards (AS3959-2009). Water is essential for firefighting. In all areas the water supply must have appropriate pressure, access and fittings and the amount and reliability is critical. Sometimes the mains water supply is cut off, so it is essential to provide a water tank and link it with a pump or generator. Any roads within the property must be capable of accommodating fire trucks, and which also require specific construction standards. Source: Pinterest - Breuer/Lundberg Cabin. LUNDBERG DESIGN livestock tank pool. 25-feet diameter and 14-feet deep. Much of the information above also applies to existing homes. The resilience of an existing home can be improved by retrofitting some building elements, such as a dedicated water, reassessing the gardens and landscaping within the defendable space and ensuring that fire trucks can access the property. Gardening is a personal activity and when planning any garden there are many things to think about apart from bushfire. Some features that home owners generally want incorporated in a garden can reduce the spread of fire by placing them between the house and the bushfire hazards. These can be paths and hardscaped areas, pools or water features, tennis courts and vegetable gardens. Whatever the style of garden is chosen, it must be appropriate to the local risk. Consider the bushfire risk early in the planning process by incorporating some of the design principles, which I will talk about in the next instalment of this blog. Can you bushfire proof your home with smart landscaping? The correct answer here is NO... But you can go a long way to reducing the risk of a bushfire destroying your home by knowing some of the ins and outs of what drives a bushfire. By planning the layout of the home and surrounding garden, adopting some smart planting ideas, and with regular maintenance and management you can dramatically reduce your chances of losing your home to a bushfire. Planning ahead is essential for surviving any bushfire season and the most effective way to do this is to reduce the location and arrangement of fuel around your home. All plants will burn, given enough heat, but measures can be taken to reduce the intensity by carefully selecting the correct garden plants. Landscaping for bushfire means the planning, designing, planting and management of the areas around the house. The aim is to keep the areas closest to the house and other structures of the property free of plants and trees that easily ignite. Over the next few weeks I will look at each of these areas, a bit more in depth, with a 6 part series, to help you stay safe in summer. But firstly, we need to look at how fire behaves. There are 3 main factors that effect how a bushfire behaves, topography (slope), weather, and vegetation (fuel). Topography - fire races uphill. As the slope increases, the faster the fire races. Weather - hot, dry, windy conditions dry out vegetation and provide ideal conditions for a naked flame to take hold. Vegetation - plants are the primary source of fuel for a bushfire. The amount of fuel available to a bushfire and where the fuel is located can directly impact on house survival. Fuels such as fine leaf litter easily dry out, ignite and can be carried as embers. Shrubs, vines and other elevated fuel can act as ladder fuels, allowing fire to climb into the canopies of trees, significantly increasing bushfire intensity. Breaking up the continuity of the vegetation, with irrigated lawn, hardscaping, pools and other water elements, can limit the spread of fire within the garden. Remember there are no ‘fire proof’ plants. All plants can burn under the right conditions – typically in extreme fire weather following extended drought. Ember attack - ember attack is the most common way houses catch fire during a bushfire. Ember attack occurs when small burning twigs, leaves and bark are carried by the wind, landing in and around houses and their gardens. Radiant heat - Is the heat created from combustion during a bushfire. It can ignite surfaces without direct flame contact or ember attack. It dries out the vegetation ahead of the bushfire so that it burns more readily. Can crack and break windows, allowing embers to enter a building, and distort and melt materials such as plastic. Direct flame contact - occurs when flames touch an object. Any burning vegetation can directly ignite a house if it is planted in the wrong location. Wind - can be very destructive to houses in a bushfire because it carries embers, causes trees to fall onto buildings, breaks windows, loosens roof tiles and can even blow roofs off houses under severe conditions. In my next instalment of this six part series we will look at ways of reducing these risks to your home, with better planning, especially if we can get involved in the early stages of the home design.